Making changes to a website design is critical for today’s website owners and online marketers alike. Wondering why? Well, with many new websites being created each day, ideally ones offering something better for your users, it becomes important to look out for ways that helps in making your site better than competitors. If you are a Developer you I suggest you to read WordPress Theme Customization API For Developers Post. In order to retain the popularity of your website and to keep your visitors coming back for more, think about the changes that can create a profound impact on your users’ mind and encourage them to visit your site time and again. It’s pretty common to assume that re-designing a site based on “best practices” and latest “web trends” can increase conversions and sales. But that’s a wrong notion. Of course, at some point of time you will need to re-design your site, but that’s only when even making a few little improvements can’t get expected results. Simply put, simply customizing your website design can save you from having to redesign the entire site, while improving it as per the modern day trends and audience needs. 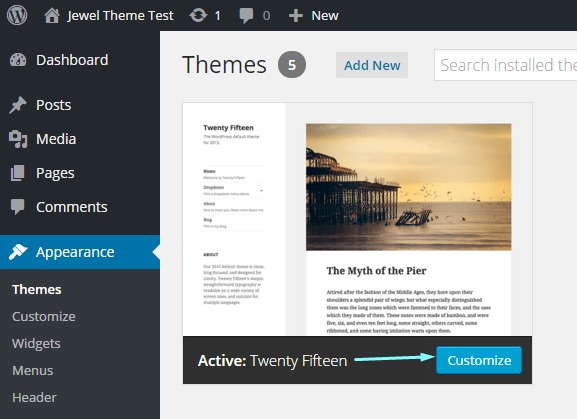 Customizing a WordPress theme wasn’t an easy task until the Theme Customization API was added to WordPress version 3.4. This WordPress modification feature helps modify and preview the changes made to the site’s appearance settings, before implementing the changes to the live website. Chances are that you might have a basic understanding of the WordPress Theme Customization API feature, but some of you might still want to know what it is and what it does. Read on to get more information about the Theme customization API. What is Exactly Theme Customization API? In essence, the Theme Customizer makes it possible for site owners or developers to customize the appearance of their WordPress site/blog and make changes to certain features, while seeing a real-time preview of how changes will look when they’re implemented in the theme. What Benefits Does the WordPress Theme Customization Feature (i.e. Theme Customizer) Provides? The WordPress modification feature, i.e. the Theme Customizer, proves beneficial for both end users and developers. As far as your website visitors (and customers) are concerned, you won’t have to swap from the admin dashboard screen to your live website or blog to know the outcome of the changes that they’re making. What’s more, using the Theme Customizer feature gives developers and designers the ability to ensure that product they are creating will provide the best experience to users as expected. To be more specific, the Theme Customizer closes the gap between what users believe is going to happen and what exactly will happen. This is because the Theme Customizer enables developers to see what users are able to see in a website in real time. Helps in improving the way using which users customize the theme. You can add new settings, sections and controls to the theme customization screen – that gives more control over making adjustments to the theme. 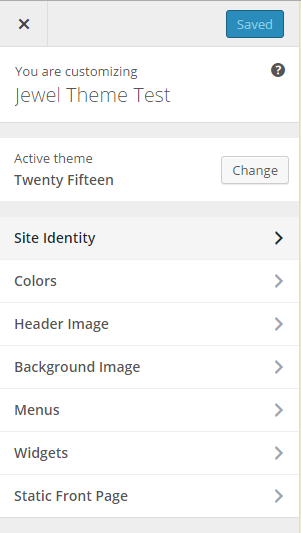 Note: As you can see, we’re adding the Customizer in the WordPress default Twenty Fifteen theme. However, to change the theme, you’ll have to activate your choice of a theme first. So now that you’ve accessed the theme Customizer, you can see several links on the left side of the screen (As shown in the image below). Just click on any of those links for modifying your theme. Set Title & Tagline, Colors, Header image, etc. are basically Customizers feature and built-in sections available in every WordPress theme that allows to make edits to a WordPress theme. While the options in the Customizer can vary from one theme to the other, but most of the themes contain the options displayed in the above image. If you’re satisfied with the changes you’ve made using the Theme Customizer, don’t forget to click the “Save & publish” button to save the changes you have made. Modifying your WordPress website at regular intervals will help in keeping it updated, which in turn will help in increasing user engagement. But, it’s not feasible to redesign your site to make a little improvements to its appearance. Thankfully, the WordPress modification feature, i.e. Theme Customizer (or Theme Customization API) gives the ability to make changes to the theme and preview whether the changes you’ve made meets your expectations or not. Author Bio: Sophia is a renowned WordPress developer by profession. If you’re about to hire WordPress developer, then you can get in touch with her.